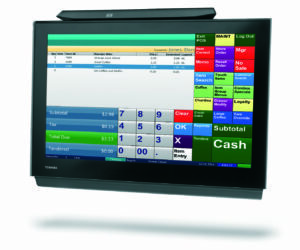 Toshiba TCx Wave is a sophisticated retail-hardened flat-panel touch screen POS solution, with a modular architecture which gives it the freedom to function as a POS, kiosk or self-service system with a variety of configurations. The new Toshiba TCx Wave’s compact form factor is perfect where retail space is a premium. Retailers and restaurant owners today, understand that sustainable success depends on providing a consistent and differentiated brand experience throughout the customer engagement. Nowhere is this more important than where most transactions are still carried out – the brick and mortar store. Toshiba TCx Wave is a new breed of retail system created to give retailers the freedom to use one platform for multiple purposes throughout the store. TCx Wave has the flexibility, performance and distinctive design that global retailers have come to trust from the team that continues to produce the Number 1 store solutions in the industry. The Toshiba TCx Wave comes equipped with the power and durability you would expect from a Toshiba POS platform. Available in Dual Intel Celeron and Intel i5 Quad Core configurations with a maximum RAM of 32GB there is more than enough horsepower for even the most demanding POS software applications. Optional peripherals include several rear display options, integrated magnetic stripe reader (MSR), and mounted fingerprint security reader. The Toshiba TCx Wave is already considered a “retail hardened” POS terminal but the available solid state hard drive option makes the Toshiba TCx Wave even more reliable. The clear advantage of the Toshiba TCx Wave is its remarkable variety of form factor options. For retailers looking for a desktop unit with a stylish cable management solution with maximum ports and interface capability, the Toshiba TCx Wave “Dock” is for you. For those that want a minimalist panel / tablet look at the POS the Toshiba TCx Wave offers an optional desktop mounting stand which makes this look possible. The Wave is Vesa compliant, so it will mount to nearly any articulating arm or bracket, so it can be installed virtually anywhere. Because the Toshiba TCx Wave is a panel PC with the CPU, memory, hard drive and cooling all self-contained within the panel, its uniquely capable of being integrated into a kiosk or self-service stand of any kind. 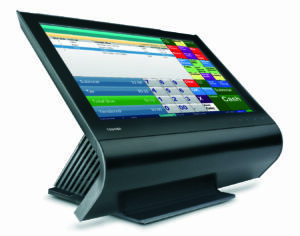 Quite literally, the Toshiba TCx Wave is well positioned as the ultimate modular POS form factor for retail, grocery, and restaurant in the industry. 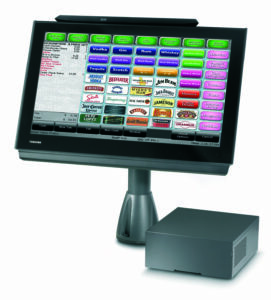 With nearly every desirable feature and configuration available, it’s hard to imagine a POS solution in the market today that can best it.